“Great Warford township is 2 miles west from the parish church and 4 1/2 from Knutsford , and was the site of a Roman settlement. There are Baptist and Methodist chapels and a parish hall. The only charity is one of a £2 yearly value. The David Lewis Manchester Epileptic Colony are the chief landowners. The soil is sandy and stiff clay; the population in 1931 was 882, area, 1211 acres. By the County of Chester Review Order, 1936, part of this civil parish was transferred to Mobberley. The history of the Wesleyan Chapel on Merrimans Lane has now been added to the site on the “Places of Worship” Menu Tab, along with some photographs. It would be lovely to identify some of the pupils in the sepia picture, one of my favourite old photos of the village. 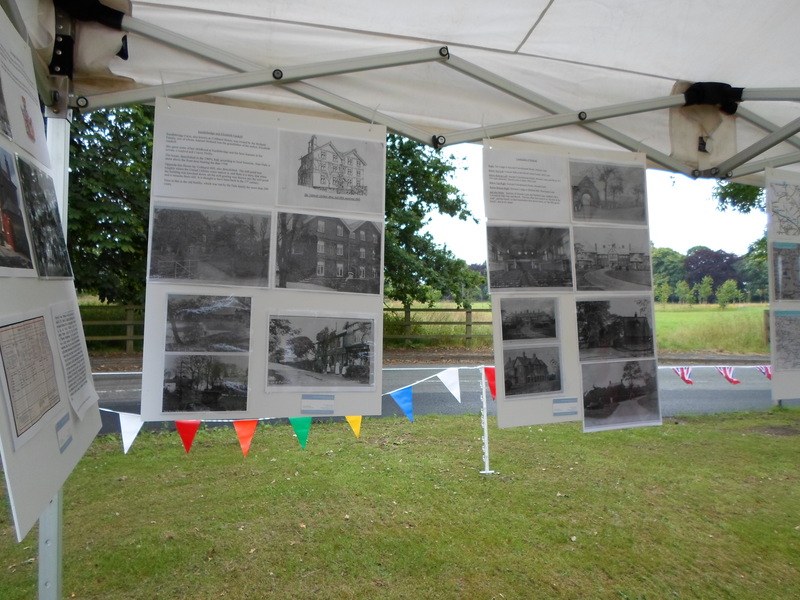 There are two community events coming up in the next few weeks which I will be attending, to help promote my research on Great Warford; I look forward to meeting many new and old faces, please bring along any photographs or documents on the history of Warford and Marthall that you would be willing to share. The first is a Family History Weekend at St Mary’s Church, Nether Alderley, which includes the parish of Great Warford. Family history records are available for perusal, guided tours of the Church and the Stanley Mausoleum will be taking place and refreshments will be available in the Church Hall. There will also be a Local World War One Display. On Sat 25th October and tree planting Ceremony will be taking place at Lindow End at Noon to commemorate those in Great Warford who fought in World War One, and also in memory of a recently deceased long standing resident. There will be a short ceremony with light refreshments available at a local hostelry. All local residents are welcome. 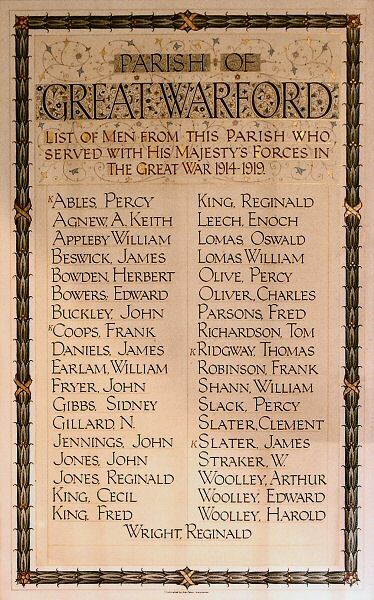 The first part of my research into local soldiers and their experiences in World War One, is almost complete, with the thirty seven names listed on the war memorial for Great Warford being investigated first. I have a fairly comprehensive story for about 50% of these, about another 20% with little information, and a few names still eluding me completely in the records. Of the thirty seven listed, four were killed in action, with a really interesting set of different experiences and contributions made by all I have managed to uncover so far. There are several sets of brothers listed, and a real variation in ages at enlistment. A small community like Great Warford, reliant in many ways on it’s strong men to toil on it’s many farms, must have felt their absence keenly during the war years. I would be delighted to hear from anyone who has any further information on any of the names listed, particularly those whom I have not been able to find as yet. If you have not already had a look, all my information is on the War Memorial Research Tab; simply scroll down below the photograph and click on one of the names. As we approach August, the official beginning of the Centenary, I will be uploading information that I have uncovered for Little Warford and Marthall, so keep checking the site. I look forward to seeing you at the next Great Warford Village Picnic which will be Saturday 31st May 2014, on the Green by Warford Crescent. I will be having a local history display, to include information about WW1 so it would be lovely to hear your comments. 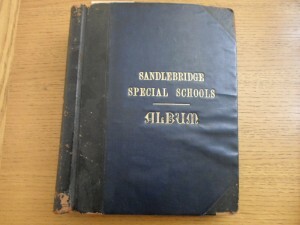 The following excerpts are taken from some of the Logbooks of Sandlebridge Schools, running from 1902 – 1916. These give a flavour of everyday life at the school, with some lovely details about some of the happy times at the School. Oct 14th 1902 – Miss Dendy and Dr Surridge paid their usual weekly visit. All the children well with the exception of J.T, who had a severe epileptic fit during the night. Oct 25th 1902 – Dr Ashby called and saw the boys at play. He noticed J.E particularly and expressed regret at the great trouble he was causing. His habits do not improve. Nov 11th 1902 – Dr Surridge and Miss Dendy paid their usual weekly visit. Dr Surridge advised that the boy J.E should no longer be kept at Sandlebridge. J.E of Bollin Fee left here today and his place was taken by W.W, who had a light fit during the afternoon. Nov 23rd 1902 – C.H Wyatt Esq. called in with sweets for the children. Dec 18th 1902 – School closed for Christmas vacation. Owing to this bad weather the boys were unable to work in the garden at the usual hour. Jan 16th 1903 – Miss Holdsworth gave her second lesson on basket weaving this morning, the children being much interested. Jan 22nd 1903 – Wrote to the parents of each child prohibiting visits to the school on account of the prevailment of small pox in so many places. Four boys vaccinated. Feb 19th 1903 – Funeral of I.M took place this morning. Children assembled as usual in the school room for prayers and singing of hymns after which we took them for a very long walk. Registers were not marked today in consequence of the sad event. Apr 21st 1903 – A large parcel of clothing arrived for the children from the Isle of Wight. Dec 10th 1911 – W.H died at 9pm. Inquest at Little Boys Home. Funeral at Alderley Cemetery, atttended by Miss Dendy, Miss Brough and parents. Dec 15th 1911 – Christmas Tree Festivities for girls. All girls had tea in Little Girls House and a magic lantern entertainment in school afterwards. Miss Dendy distributed the presents save for boys next day. Dec 21st 1911 – Miss Dendy came and called registers and also brought “Captain Scott” and the large bear presented by the Cinderella Club. Gave all the men a meat pie and the laundry women a canister of tea. Dec 25th 1911 – All the children had roast beef and plum pudding for dinner. Feb 7th 1912 – C.W whipped by Mr Appleby for overbearing manner and impudence. May 11th 1912 – Brook House opened, took in those from Big Boys House. To celebrate the opening the boys had a supper of roast beef and plum pudding. Miss Dendy had supper with them. Jan 25th 1913 – H.T ran away during afternoon school. Several members of the staff went searching for him, but could not find him. He appeared at Warford Lodge next morning and had spent the night in Soss Moss Wood. He has also taken a sixpence belonging to one of the other boys and spent it and tried to take another sixpence from a boy he met in the wood but he was unsuccessful. Received 4 strokes with the tawse for stealing and boasting about his escapade. July 14th 1913 – Day school closed all day due to the King’s visit to Manchester. All the children received a box of chocolates from the Lord Mayor of Manchester. July 17th 1913 – The Little Boys had a picnic to the Sandhills, Alderley Edge, the girls to Ollerton Wood. Aug 2nd 1913 – S.P, who has been behaving very badly again for some days ran away about 5:30pm. Could not be found but was discovered at a farm near Chelford next morning where she had arrived about 5:00am having spent the night in the open air. Feb 3rd 1914 – M.S very naughty, struck the servant, sent to bed…very defiant, isolated for a week to live on bread and milk. Allowed to mix after apologising before all the girls. Mar 21st 1914 – Electric light on at Sandlebridge. Apr 11th 1914 – Miss Dendy, turned on electric light at Warford Hall. May 8th 1914 – New telephone at the Hall. Sept 29th 1914 – L.J fell downstairs at the Hospital and cut her hand very badly. Nov 3rd 1914 – S.P whipped by the Burgess. Threw an empty cement bottle into the fire in the boys dining room which flew out and burnt a large hole in the tablecloth. Dec 11th 1914 – W.S and T.H secreted some old iron in a hedge in the garden and sold it to the rag man. Mar 9th 1915 – I.L making great disturbance at Brook House, threatening to do for people with knives. Aug 22nd 1915 – K.G put her finger through the mangle. Jan 17th 1916 – Received a note from the Recruiting Officer at Chester to say that H.C had presented himself for enlistment and enquiring for his character etc. Sent Mr Beaumont to Chester to fetch him back. May 15th 1917 – E.C. and R.Y ran away , reached their homes in Manchester and enlisted. Mar 14th 1922 – E.B scalded her feet. Meddling with pan of cocoa on kitchen fire. Sent to hospital. Sandlebridge Special Schools – Part 1. The first admission book of the Sandlebridge Special Schools, latterly known as Mary Dendy Hospital. 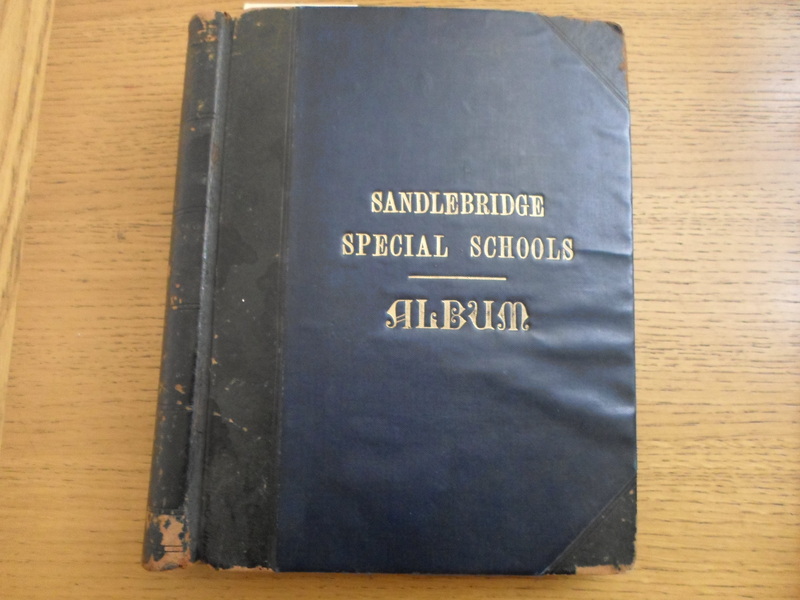 For a recent visit to Cheshire Record Office I had at last got round to requesting some archives at the early years of the Mary Dendy Hospital, called at this time, Sandlebridge Special Schools. Due to the nature of the institution I was warned that some records would be unavailable to me due to their sensitive nature and subject to a 100 year closure clause. Fortunately though I was given clearance to see an album dating from 1902, and set myself down with notepad and pencil, to make (I hoped) copious notes. I was entirely unprepared to comprehend what faced me on those first pages. Also given was their date of birth, admission date and which Educational Committee had referred them. These all too short ‘summaries’ of forgotten lives, together with some of the most haunting photographs I have ever seen, brought tears to my eyes, and for a moment I was unsure whether to carry on looking at something which felt so private. I then decided that the least I could do to honour those forgotten children was to look at every single one, all two hundred and ninety something of them, no matter how hard I might find it ; in a way it would prove that they once existed and should be remembered with dignity and longevity. One particularly poignant entry showed a picture of three brothers, all admitted the same day. In the photograph they are all smiling and one plays with a white terrier, surely a likeness we have seen in many of our own family albums. “Mongol. Been laid by with Chicken Pox. Nearly strangled by a shoelace which he allowed a smaller boy to tie round his throat”. The process of going through this book, I freely admit, was emotionally draining. Do I regret doing it? No. I had set out to look into the early life of the school and its pupils and discovered it, in all its tragic and heartrending detail. As a source, it is invaluable to social historians for what it reveals about the behaviours and beliefs of the time, but also to those brave family historians, who may find here the one and only reference to a long lost family member. Having archives such as these still in existence does not seek to justify or judge the actions or beliefs of those within but to quietly remind us that that the beliefs of the human race have been evolving for hundreds of years. The next step was to look at two logbooks which would tell me some more about daily life at the School, which I will detail in a future post. I have recently added an article about Sandlebridge’s connections to the novelist Elizabeth Gaskell. This can be found on the History Tab. Mrs Gaskell, (1810 – 1865) who is famous for such literary works such as Cranford, Wives and Daughters and North and South, lived with her aunt as a child, after the sudden death of her mother, at her house named Heathwaite, in Knutsford. What is perhaps not as well known is that she spent numerous holidays at her grandfather Samuel Holland’s House at Sandlebridge, and the building features in her letters and later novels. I have collected some photographs of the farmhouse, which would have been quite a large imposing building, but nevertheless a source of lovely memories for the young novelist. The building was demolished in the 1960’s , a great loss to the community. The excellent Elizabeth Gaskell Society hold talks every first Tuesday of the month at Cross Street Chapel in Manchester, and also on the last Wednesday of the month at St John’s Church Parish Rooms in Knutsford. 99 years ago, almost to the day, Great Britain declared war on Germany, which was a turning point in world history and led to almost seventeen million military personnel being mobilised over the next four years, with nine million of them losing their lives. Over the next four years, the Department for Media, Culture and Sport will be developing of series of national remembrance events, with partners such as the Imperial War Museums, Commonwealth War Graves Commission, the Heritage Lottery Fund, and English Heritage. Many small organisations and heritage groups with be playing their part in recording and researching the lives of soldiers and other individuals who lives were shaped by these life-changing events. For me, this is an excellent opportunity to look at the stories behind the names on our local memorials, at St Mary’s Church, Nether Alderley and All Saints Church, Marthall. Great Warford and Little Warford seem to be a rather unique place, in that throughout the twentieth century, a large percentage of their populations were housed in healthcare institutions, the Mary Dendy Homes, Ancoats Convalescent Home, and the David Lewis Epileptic Colony, employing many local staff to support these. Because of this, I would also like to investigate what impact the Two World Wars had on these; did they lose many staff to the war effort, or were these occupations “protected”? The Mary Dendy and the David Lewis Colony became practically self-sufficient through the setting up of poultry and vegetable farms, a welcome addition to the inevitable rationing? Were patients set to work in producing items for the war effort, and if so, do we know the destination of any of these items? With such an interesting and potentially, large and time consuming task ahead, I am uncertain how this will be ultimately be presented on the website, but I am looking forward to the challenge! 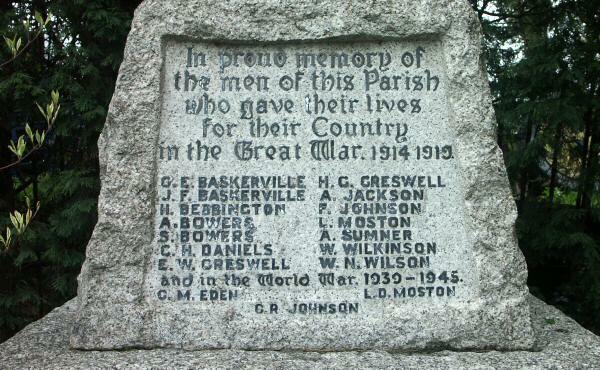 The memorial to the parishioners of Great Warford who served in the Great War, 1914 – 1919, located at St Mary’s Church Hall, Nether Alderley. The memorial to those who fell in both World Wars from the parish of Marthall, located at All Saint’s Church, Marthall. The Great Warford Village Picnic was a roaring success, with a teddy tombola, plant stall, BBQ and plenty of tea and cakes. 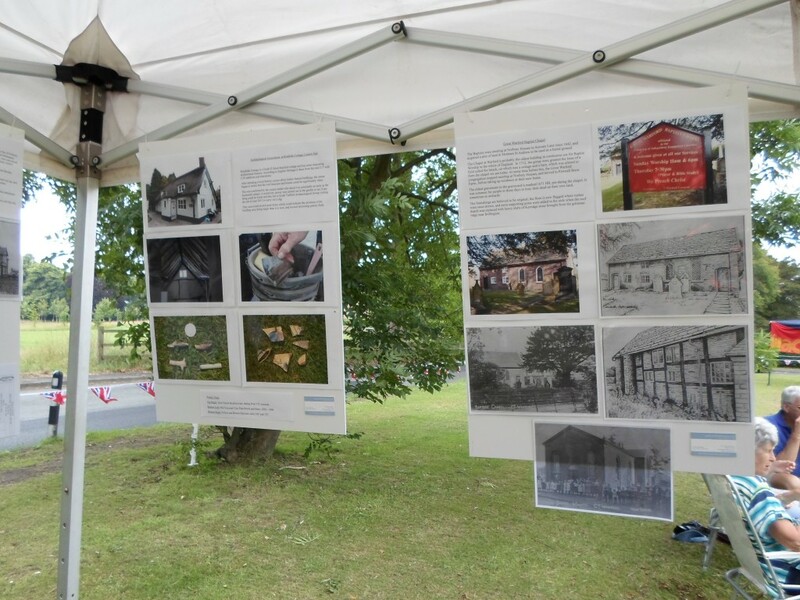 It was also an opportunity to show local residents some of the research that has been done on the area, by means of several display boards, which told the story of some of the main landmarks of the village. 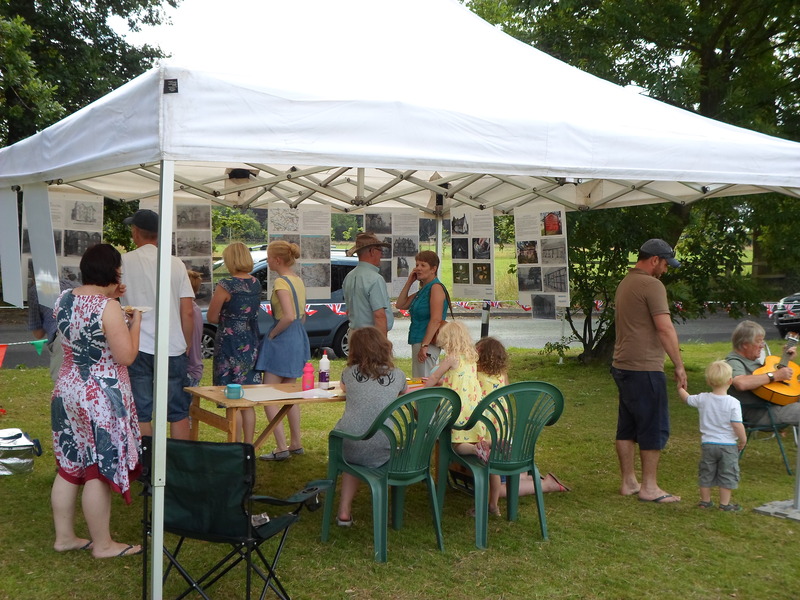 There were plenty of visitors and plenty of conversation, and great feedback, both from those who have lived in the village for many years, and also relative newcomers. 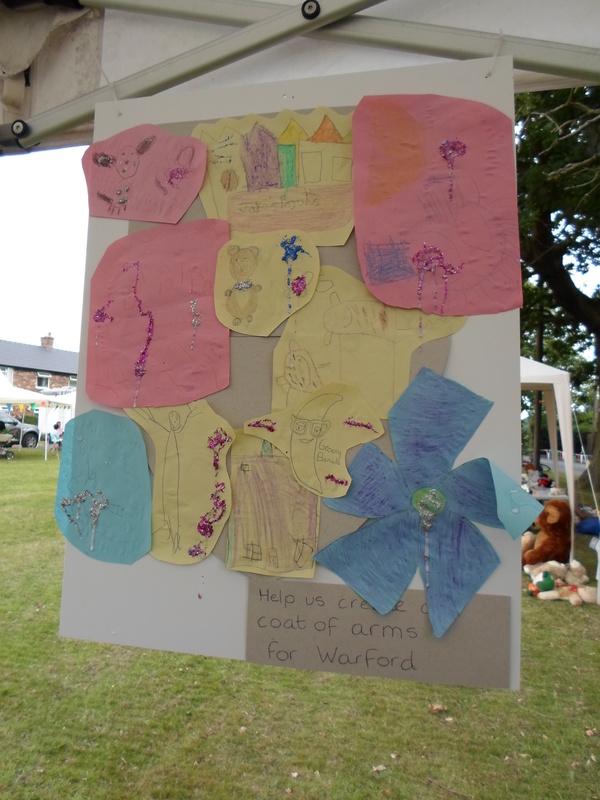 I must give special thanks to George, Jake, Melissa, Lola, Esme, Izzie, Sophie, Martha, Emily and Edward for drawing some fantastic pictures so we could create a glittery coat of arms for Warford! A great afternoon was had by all, see you again next year!